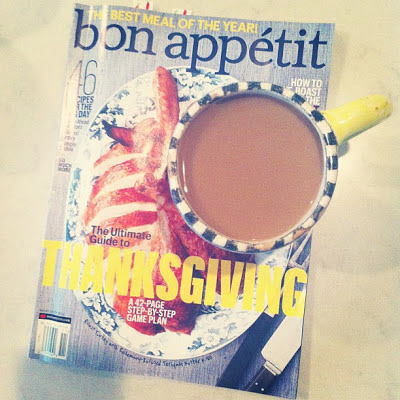 Thanksgiving morning was spent in the kitchen, good music playing, coffee, cookbooks, and Stella by my side. In those quiet morning hours, I thought about all I am thankful for- and there really is so much. My HUSBAND. My family and friends. Our health. An almost one-year old white dog that minds most of the time. A rowdy five year-old boy. A productive garden. A kitchen in which I can cook. Good music. New life. This year is one of the first I've really gotten to contribute a number of dishes; and for me, nothing could be better. 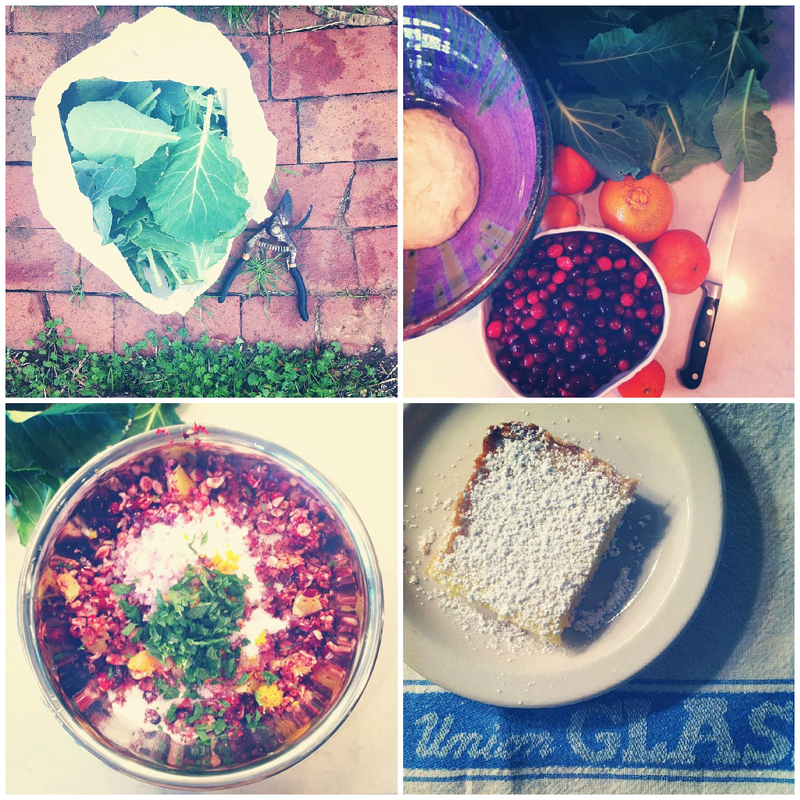 I made tomato-braised collards with caramelized onion grits*, Bon Appetit's Parker House Rolls and cranberry-orange relish with mint, Smitten Kitchen's baked potato crisps, and Cooks Illustrated's Perfect Lemon Bar. Things turned out like this: if you like spicy food, I recommend the collards for an unusual take on your typical green, and definitely serve them over grits as Gillespie recommends in his book. Speaking of the grits, Gillespie claims that if you cook grits with caramelized onions overnight in a slow-cooker, they'll be intensely creamy when served. I cooked them 5 hours instead of the 8 called for, but they were super creamy - so much so that everything assumed they had cheese in them. The Parker House Rolls were buttery and salty, delicious eaten alone, stuffed with turkey or drizzled with honey. SO GOOD, please please make them for your next gathering. And, the dough can chill in the fridge for up to 6 hours before baking, making these much less time-centric. The cranberry relish: I used less sugar than called for, resulting in an acidic dish. Perfectly acceptable, but hard to eat much of. (Does anyone eat more than a spoonful of cranberry relish at Thanskgiving, anyway?) As for Deb's baked potato crisps- HUGE HIT. All you really need is butter and potatoes- the toppings can vary widely depending on what you have available. We used bacon, cheddar, chives and sour cream. Very little hands-on time required, and they disappeared within 15 minutes. Finally, can you ever go wrong with a lemon bar, especially a Cooks Illustrated recipe? No, you can't. Make these too - just be sure to sieve on the powdered sugar right before serving as the bars will soak it up if added any sooner. We celebrated family-style at our neighbor's house, with too much food, flickering candles, and our loved ones. And as things go, that night I felt this baby in my belly move for the first time. Kinda perfect, right? Hope yours was great. P.S. If you want any of these recipes, let me know and I'll post.